Here’s your starting point for 2018. Actually it’s where we left off in 2017 with our youth football offensive section and we are in the process of making it even bigger and better here in the next two months. We are working on two new formations for you as well as installing a few new plays for the existing formations. We are even experimenting with putting together some small packages that tie plays in with one another. This will allow you to set plays up off of other plays. We have received quite a bit of input over the winter months from our youth football coaches and it has been very helpful. So as we begin expanding and improving this section of the playbook we want to remind you of what we currently offer you. There is a reason FirstDown PlayBook is the official playbook resource for USA Football and Football Canada. It’s because we have done the work that most refuse to do. It takes a lot of time and detail to draw up ten different formations with twenty some offensive football plays in every formation. These formations are designed with your needs as a youth football coach in mind and much of this section comes from direct feedback from you! The FirstDown PlayBook difference does not end with the “What” either. It’s the “How” that makes us different. We understand that if we are truly going to help you coach your youth football team then we need to give you detailed help instead of giving you just enough information that comes up short when you actually get on the field and begin coaching. All run plays are blocked up vs six different youth football defenses. All plays can be flipped to run both ways. All plays are in color. All plays have coaching points and assignments for every player. So as you begin to think past baseball season and start your planning for the fall, know FirstDown PlayBook has your back and we are even offering tremendous discounts in the month of April for you youth football coaches who want to get started now! 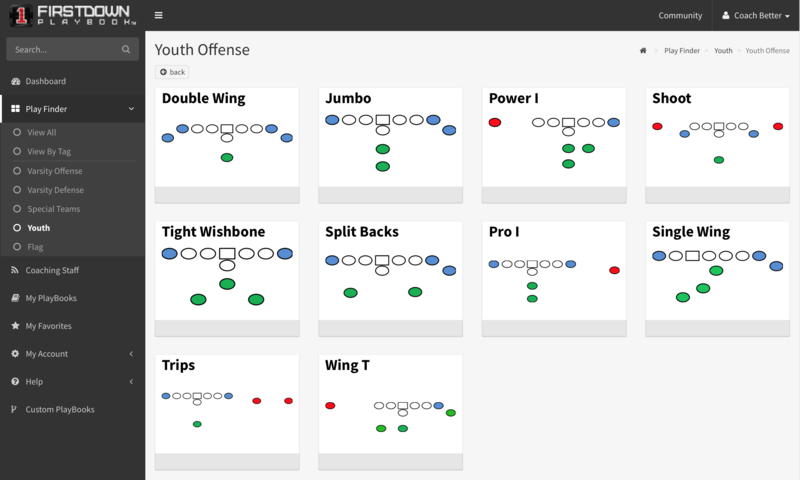 Tap here or on the pic below to visit the FirstDown PlayBook Youth Football Offensive section!